Well hush my mouth, everything I have read up to this point pointed to it just being a test of the technology and logistics. In any case the first line of the bit you quoted clearly states what the main aim is, "to see if the tehnology can be used elsewhere". The turn off appears to be before there. I also understand that there are issues at Parkgate where the owners of the retail park are concerned that their well used shoppers car park could be used as a park and ride site, if so, could be a difficult one to resolve . Maybe when IKEA opens that line will be used more often? People may visit retail park more often and it could give some incentive to take tram to arena or Cineworld coming from Rotherham. But this is just a guess of course. If IKEA causes traffic to get worse it would give drivers another incentive to bypass that area with tramtrain. Since all bus services past the Ikea site have now been removed in the name of progress it will be the only public transport system to pass there. IKEA is not a public transport destination, as a general rule. The only exception I know of to that is the one in Ashton which is next to the tram terminus, all the other ones I know of are on out of town retail parks with limited public transport links. Plus try carrying a cupboard back home on a tram. OK, but not really connectivity, just a stop on the periphery of the Giant Meadowhall site. Most buses going in and out that way only drop off very few passengers at the bus stop nearby with the majority choosing to go to the bus station. 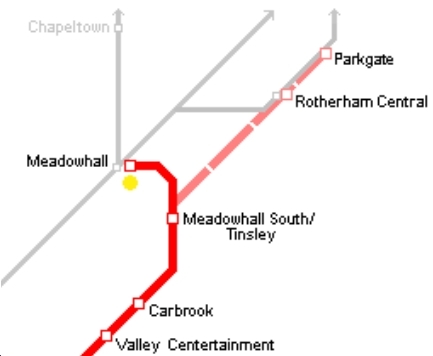 Since there are numerous means of getting to meadowhall from Rotherham ( in fact you cant avoid the place) I cant see it being an issue. Personally I would not use it, but I suspect since the removal of any direct bus to sheffield from Rotherham it may have an appeal. As for going to parkgate, I can see little or no demand for that. Ikea also sells items you don't need a car for, some people go there just to eat meatballs. Ikea also sells items you don't need a car for, some people go there just to eat some meatballs. True. But as I said, try taking bulky items home on a tram. Also true. Still tram train could be very useful for many other things or people who cannot drive due to medical reasons, IKEA is not a cornershop. And? They are still rather heavy.